One is in a corner tuning a Puerto Rican Cuatro. Another dances in the hallway by himself. Another does sit-ups. Another whispers lines to himself. Two others chat quietly, and I can only assume it’s something funny. They both giggle, and I wish I knew the joke. Another lies on the couch. Eyes closed. Soaking in a bit of rest before they begin. All is part of a personal routine. Actors prepare for what’s to come, for what will be asked of them, to live a different life, to be angry, to lose a loved one, to be happy. They will be asked to live. They will be asked live again and again and again until that life is perfect. Until every word, every movement, every entrance and exit, every punch line is perfect. And I think of Shakespeare, and how all the world’s a stage and how everyone is a player with entrances and exits, and I wonder how different life would be, if everyone rehearsed, if everyone took the time to go over their lines to find just the right way to say it, to take a moment to dance by themselves before starting their day, to rest, to joke with a friend, to exercise, to create music, to know when to enter, to know when to exit, to know when it’s over. Would life be perfect? We’ll never know, but it’s fun to wonder. I sat in the corner of the room trying to be as unobtrusive as possible as I watched the team begin rehearsal. This is my second time in the room and tonight there are more actors who are present, and we are in a smaller room. Finding a space to be an invisible observer was challenging. Despite my efforts to be a fly on the wall, Baleigh, the Stage Manager insisted on setting up a table for me to sit at. I insist on helping move the table since it is for me and I settle in. Not long after Josh enters the room and outlines tonight’s rehearsal “….over there”, “….at the table” MY newly acquired table. It was back to my perch on the wall! On November 1st, two amazing plays will open on Profile’s stage to an anxious audience that will be moved and delighted they have chosen to be a part of the magic called theatre! They will not know that what they are watching is the long, hard, painstaking creative work that is transforming from lines on a page into blocking, coaching, and table-shifting through masterful directing: Beautiful Chaos! Behind the scenes the cast and crew have to weave rehearsal time, fittings, lighting, sound checks, blocking, fight instruction, falling instructions, equity breaks, photo-ops, random drop-ins from community members, room shifts, schedule shifts, life shifts into a finished product that will tell the story of an often distant writer. There’s no tweeting a line correction. No running down the hall to ask, “why is this character saying this? Or doing this?”. It’s their creation left in the hands of other creatives to produce something worthy of the story being told and the time of those watching it. All of these pieces, seemingly jagged edges of a too many to count jigsaw puzzle, slowly come together into a final masterpiece that hopefully hits it mark. This “Beautiful Chaos” of voices, instructions, changes, revisions, props, staging, and so on is all thought-out (sometimes) to provide a honorable storytelling and memorable viewing experience. The unpredictability of some of it, #thatpart is the beauty of it all. Some of the chaos is orchestrated by the playwright themselves, some by the constraints of time, budgets, space, and resources. But somehow, all of these puzzle pieces scattered across theater floors all-around the globe come together for that opening scene on opening night to wow audiences with laughter, love, horror, and a host of other emotions night after night after night. I am grateful to be a part of Profile’s Community Council! This rare privilege allows me to peek behind the curtain to see the beautiful chaos take form, to have a voice at times in the shaping and storytelling of narratives for and by impacted communities, to engage the creatives and the audience in dialog beyond the scripts, and to see amazing theater right here in Portland. It’s a beautiful Sunday morning in Portland, Oregon and I’m driving with the windows down on 84 west and take the downtown exit. I’m on my way to a rehearsal for Water by the Spoonful to see the work that goes into making a Pulitzer Prize winning play a success on a Portland stage. Water is the second play of a trilogy that Profile Theatre will be putting on, a trilogy written by Quiara Alegría Hudes inspired by a relative of hers that was a veteran. That’s how I got involved. It was important enough to Josh Hecht, the artistic director and director of the final two plays of the trilogy, to invite veterans like myself into the process. I am a Purple Heart recipient and Iraq War veteran who has spent the last ten or more years trying to help other veterans suffering from the unseen wounds of war with art. I put on art therapy groups with painting, monthly writing groups, and workshops around the country, so when I was asked to be on the community council, I jumped on it. Spending my Sunday morning in a brown rehearsal room was an amazing experience for me. As soon as I walked in the room I felt the artistic and creative energy. There were eight people in the room. Half were actors and the other half were just some of the staff behind the scenes who work so hard to make the production come together. I watched as the actors went through their lines. Josh listened and spoke softly. He gently coaxed out ideas from the actors about their characters, their dialogue, and the space they inhabit. He did this instead of giving obvious instructions. In this way all the actors understood the changes made. It was all very inspiring. Josh’s commitment to community engagement is something that I wish more artistic directors across the country shared. I know that art heals the soul because it saved my life after coming back bone-broke and soul-shattered. Art helped me put my life back together again, so being able to bring veterans to the shows, having the monthly writing groups that Profile Theater has hosted and produced, and allowing our veterans to speak to the audiences and be a part of the process has done so much toward helping veterans in the Portland community. …The Happiest Song Plays Last finishes up the trilogy. As a special bonus in all of this, Profile Theater has partnered with the Writer’s Guild Initiative… they have been bringing award winning writers across the country to work with the veterans in the monthly writing groups, and they will be showcasing the veterans’ work on stage on November 13th. I hope to see you there. Spoonfuls of Notes on a Scene, Rehearsed Three Times. During break, actors’ conversation covers road rage song and Barry Bonds, and concussions in football vs. steroids. Actress performs handstand into laying down on stage, complimented. Motivation conversation. Play around with letting some of that excitement into it, so that here is a real turn, her disappointment as she waits and waits and waits. Break up each sentence into a step into the realization he isn’t coming. At the end of the first time, laughter and a reference to Ghost. “If you need to go, then go” is more intense, more insistent. She is relaxing into the sorrow. Line flub on “It’s okay” allows Odessa to restart to her preference. Third time, a little more sunk into the sadness, earlier. More angry less insistent, claims her space, her function in the emergency. Actors use laughter to get back into the scene. A reminder that this is heightened, we’ll both keep our eye on it, look at the moment letting her go. A characterization of the creative conversation: open, receptive, collaborative, each person has an opinion that is specific, rooted in action or text, and to be valued. Upon walking in I hear, “it’s those moments of breath that allow the audience to catch up”. The actors are rehearsing a fight scene. Another actor, waiting to be called, turns to a friend and says, “what’s up sweetness and light”. I am watching scene practice for the upcoming play Water By the Spoonful. I notice how the actor questions how a ghost would fight. I notice how I close my eyes when the actors say something that cuts deep, and keeps reverberating in my head. I remember, I am a vessel for the feelings produced in each play by Profile Theatre. I realize the necessity of theatre in our modern world and it’s my duty to share, and allow you to experience these incredibly powerful moments. From the Community Council for 26 Miles. I attended a rehearsal of 26 Miles by Quiara Alegria Hudes presented by Profile Theatre. It was so refreshing to watch the actors work their scene, review their character’s lives, work through the social constructs their characters live in, and then see the actors make new choices for their characters, discover new things, take risks. I kid you not, I felt like I was in a Narrative Therapy session. The director was like the therapist working closely with the client helping them uncover/discover/reveal their emotional lives beneath the surface to make new bold creative choices. I’m in love with Profile Theatre! Thank you for making loud, proud choices and presenting relevant work during these trying times. Blessed be! Admittedly, when I was approached with an invitation to join Profile Theatre’s Community Council for their current show, 26 Miles, I proceeded with immense caution. In the past I’ve found these sort of invitations to be disingenuous or these experiences unwelcoming and tokenizing to an ambitious and assertive woman of color actor such as myself. Typically in these spaces, I’m overwhelmingly surrounded by older, whiter, wealthier, more well-educated folks than myself. The end result is not the engaged and inspired one that was likely dreamed up, but one of deep resentment at being a politely checked off box of a diversity effort. It’s an appeasement of a trend towards “equity” while still keeping art, creative work, and most importantly theatre elevated and accessible mostly to those who identify with whiteness. When I walked through the door of the rehearsal room at the first read through I was unsurprised to again find myself adrift amidst by the typical theatre patrons: affluent white folks over the age of fifty who come looking to be entertained. I took a deep breath and continued forward into the room, determined to follow through with my commitment to the Community Council. I found a seat, selected some snacks, and began to observe. Here’s what I noticed that was different from my past experiences: There were two folks animatedly speaking in Spanish to one another. These two people turned out to be two of the actors in the cast. I was struck by the authenticity of their identity– real people cast in real roles that feel as though they’re truly written for them. While this may not seem notable, as an actor and woman of color, there a precious few strong, beautiful, authentic, and inspiring roles written with us in mind. Here, Profile Theatre has found a treasure in the work of Quiara Alegría Hudes. In addition to doing a spectacular job in casting, they’ve also selected a director who clearly loves the play and feels some deep connection to the work as a part of the Latinx community herself. I can honestly say that Profile has a new fan. The play itself is stunning. There were so many moments in which I felt that the anger, pain, confusion, disgust, and hope that Olivia experiences are a mirror of my own childhood. I too grew up a mixed-race child, raised by one side of my family and always feeling like I didn’t know or understand half of my own heritage– for me, raised by my Japanese family and devoid of my Mexican ancestry. I too angrily and clumsily sought to uncover the missing pieces of my identity without realizing that’s what I was doing. I too enveloped myself in creative pursuits, chased excellence, and clung to an obsessive dream of escaping someplace and seeing some distant creature (for me, it was wolves and not buffalo.) I too know how all-consuming humiliation and non-acceptance from peers can feel, and how it can make irrational and self-destructive actions feel like the only reasonable option. I too didn’t appreciate or understand how deeply my mother loves me, how forgivably human she is, and how much we truly need one another to grow past our own pain into whole people. The initial read through was memorable, the second rehearsal I attended was thoughtful, delightful, and deliberate. I look forward to seeing the staged production next week, where I’m sure it will be nothing short of breathtaking, heartbreaking, and immensely healing for someone like me: a young woman on a lifelong journey of fitting together the halves of my own identity. When I first read 26 Miles, I was surprised to find myself in the character of 15-year-old Olivia. Like Olivia, my parents were divorced and I never experienced any of the culture of my Mother’s Colombian side of the family. She was a “Spanish Beauty” in her day and I “don’t even tan right,” as Olivia quips to her Mom. 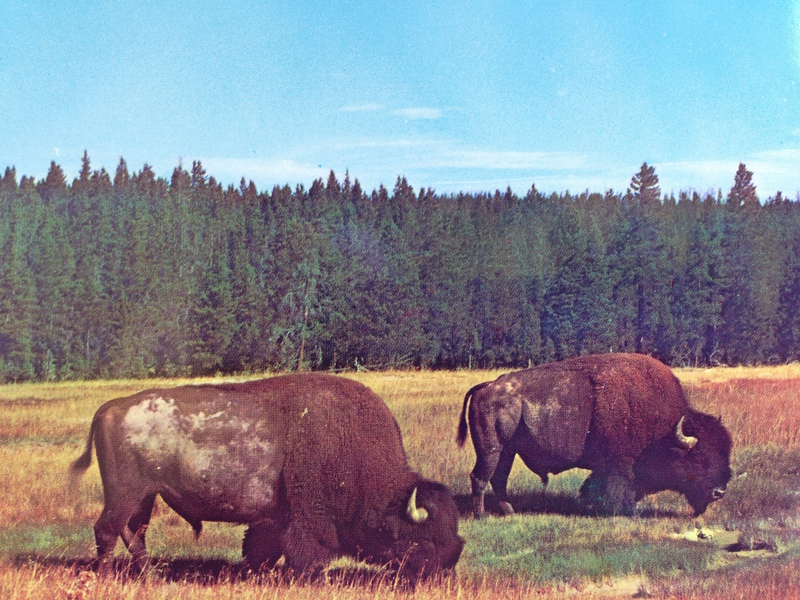 Like Olivia, I was a writer with an obsession for buffalo and Yellowstone Park. Yup, odd as it seems, buffalo enthralled me and the majestic view of Yellowstone’s Hayden Meadow, with hundreds of the magnificent beasts entranced me. I desperately wanted a little stuffed animal buffalo I found in the gift shop, but I didn’t have enough money and I felt a little childish desiring a toy at age 10, so I bought this post card. Invited to a rehearsal for Profile Theatre’s production, I walked in expecting to find myself on-stage in Olivia. But memory and nostalgia butted heads with reality and the present, and now that I am the mother of a teenaged daughter, I found myself relating to the mother character. Beatriz and I have little in common except the shared experience of loving your daughter so much that her pain cuts you so deeply, you can’t breathe. And when someone teases and hurts your child, the anger is so hot, you can’t see. Despite this astounding love, mothers make mistakes. We need our children’s forgiveness just as much as they need our acceptance. –Diane Englert, Executive Director of Staged! When I first heard this play I was grappling for a timeline. A direction. The second time I heard the play, it was like driving home. I knew where we were headed and I could get lost in the gush of the wind…Being on Profile’s Community Council has allowed me the incredible opportunity to practice watching theatre…this is what I wish most for my peers: the opportunity to practice. To appreciate the levels of creation in theatre one must practice. From the Community Council for Elliot, A Soldier’s Fugue. Last week, I got to eavesdrop on rehearsals for Quiara Alegría Hudes’ Elliot, A Soldier’s Fugue at Profile Theatre in Portland, and I was so pleasantly jolted back home listening to the actors and directors negotiate Spanglish, Spanglish accents, Spanglish music and Spanglish family matters, all in service to such a sharp script. The play reads to me like a critique of the US war machine and its exploitation of brown people, an amazing and kind of ruthless tribute to Rican dads, and one of the kindest provocations to Latino masculinity I’ve seen. I’m looking forward to the final production—the first in a trilogy Profile is producing throughout the year, including Water by the Spoonful, which is my favorite. Go see. When I came in to speak to the cast of this amazing play (Pulitzer Prize finalist! ), they were so welcoming and eager to hear about my story as a Purple Heart recipient with multiple tours. We all sat in a small room, with more people than chairs, and I told my story. I described the depression, rage, and guilt that comes with surviving a coordinated ambush in combat and then being sent home to attempt a transition back into the civilian life. They created an atmosphere safe enough for me to tell them some of my most vulnerable stories including past thoughts of suicide and acts of self destruction. Afterwards, they asked questions for a while. Some about their characters, other about my life, but also some questions about veterans in general. These last questions, I noticed, were changing their views on how they pictured veterans. At the end I must have hugged each one of them before leaving.